You can use Control Center's export utility to migrate scenes from the database. You can either export them to offline, which makes it possible to open and work on the scene in Harmony without being connected to the database. You can also export them as database scene packages for backup, archival or to transport them to another database. README.txt: Contains export statistics, such as creation date and user ID. 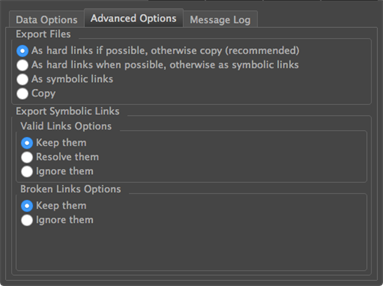 IEContents.dat: Specifies export parameters. This file allows Control Center to import the scenes back to a database. 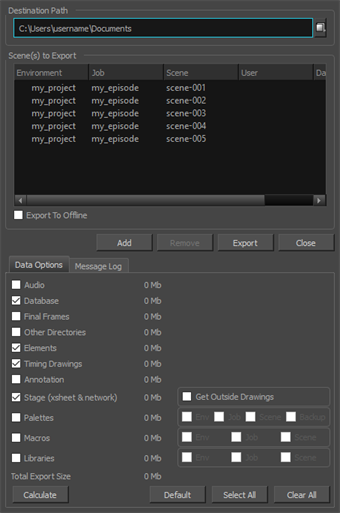 If you want to export your scenes as offline scenes that you can open in Harmony Stand Alone, check the Export to Offline option. If this option is not enabled, your scenes will be exported in a database package that can only be imported into a database. Windows: Due to constraints in the operating system, you do not have any choices on the Advanced Options tab. In GNU/Linux, you can make the following selections. (macOS and GNU/Linux): Select how you want to package the exported scene. The choices you make here are related to the size of the export package as well as the speed of the export process.